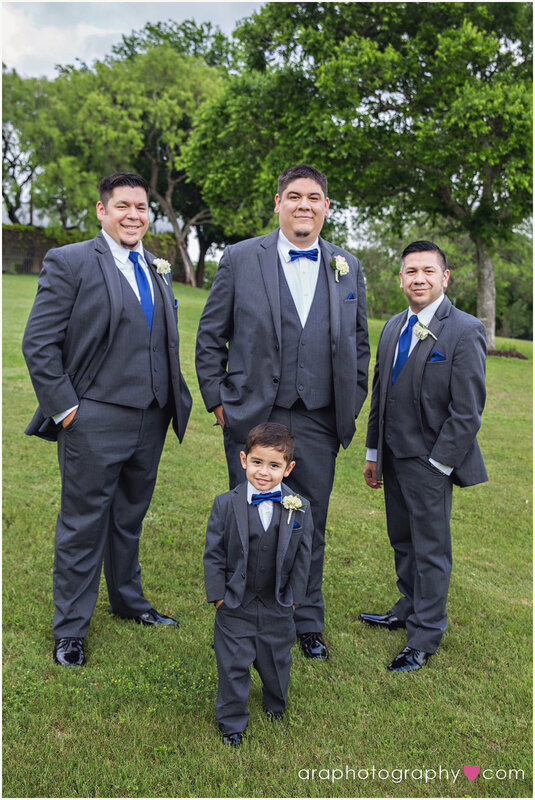 Ashley and Josh were married in San Antonio, Texas at the lovely Granberry Hills in their Hillside Pavilion and Ballroom. Ashley and Josh have been together since high school. Josh surprised Ashley with a Christmas Day proposal in front of family. She said, "yes!" and the wedding planning began! The wedding colors were pink and blue and the bridal party consisted of the couple's siblings. Ashley looked stunning in a classic white gown and fingertip veil. Josh was charming in a gray suit and blue bow tie. The couple exchanged their vows under the covered open air pavilion. Ashley caught a case of the giggles during the ceremony, highlighting just how loving and silly their relationship is and will continue to be. After the touching ceremony, the reception began in the beautiful ballroom. Everyone had tears in their eyes as the couple danced to "Stand By Me'. The evening ended with a magical sparkler send-off and the couple set off on their new adventure as husband and wife.